Both of our daughters put in small gardens this past spring. The planting, tending and harvesting has gone fairly well considering that they are novices. That said, if any of us were to attempt to live off of the collective produce of our small gardens, we could all expect a dramatic weight loss. The basil has done well, but man does not live on pesto alone. The parsley is nothing but nubs, but the rabbits are happy. There was the promise of some beautiful beefsteak tomatoes, but the vine, heavy with fruit, crimped at the base and withered. The youngest put in pole beans. She had a few missteps early on with planting and thinning, but she just shared a picture of the harvest via text message, “You want beans?! We got beans!! 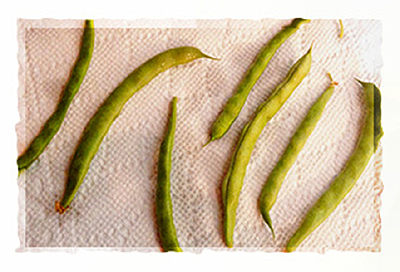 !” The beans look great — all seven of them spread on a paper towel. 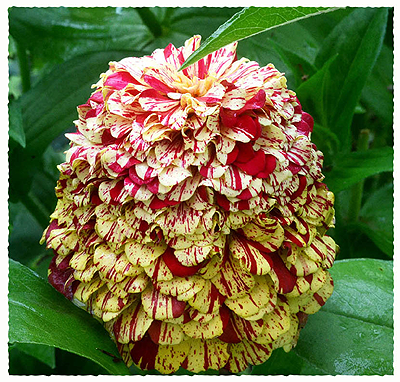 She also tried her hand with a few seed packets of zinnias, casually tossing them in the soil as she walked away. She now has a bright and cheery stand of zinnias including exquisite doubles that are a hot pink and white marble pattern worthy of a Rembrandt. The adventure of growing anything lies in being both sadly disappointed and pleasantly surprised. Because every kid should have the joy of harvesting potatoes at least once in childhood, I helped a few of the preschool grands plant seed potatoes earlier this spring in a cold drizzle. They (the grands, not the seed potatoes) have been ecstatic from the git-go. As it turned out, a thistle had sprouted, but the potato shoots weren’t far behind. We could have wrapped those spuds in colored lights and told them it was Christmas. There are great lessons to be learned in the garden – chief among them, how to be faithful to the process of nurture even when the outcome may be uncertain. As for us, for years we grew raspberries and they did well. We even gave starts to several neighbors. Then our trees grew and shade overtook the raspberries. Our neighbors’ berries flourished while ours disappeared. I asked for a start from a neighbor this spring. We planted it in a sunny spot and it is doing well. If the raccoons and squirrels stay away, at last count, we will have 18 berries. With a couple of those potatoes and that one green bean, it should be a wonderful feast. People are buzzing because Hillary Clinton, who likes to portray herself as an average American, is shelling out $400,000 for two weeks in a vacation home in the Hamptons with private grounds, a hedged-in swimming pool and sweeping views of the ocean. Holiday Inn Express does offer free high-speed Internet access in every room, but no private servers. So, no, it’s not going to happen. Send Mike Huckabee to a Motel Six. Leave the light on. And a Bible in the drawer. He’s as close to a regular guy as any of them. Last time I stayed at a Motel Six, which was years ago, “breakfast” was in the lobby—a basket filled with a half dozen stale sweet rolls wrapped in cellophane. Huckabee strikes me as a man who would graciously take one and even say thank you. Carly Fiorina might be more comfortable at a Hilton Garden Inn. They’re classy, upscale and, if I remember correctly, have bathrobes hanging on the back of the bathroom door. She seems like a white fluffy robe sort of woman. Hilton Garden Inns have all the amenities, but they don’t do the communal breakfast thing. Breakfast is on your own in the restaurant, separate tables, separate tabs, no free mints. Bernie Sanders might enjoy an elder hostel somewhere, maybe in the dorm room of a small liberal arts college. He’d also be fine with cafeteria food. Trump doesn’t need a hotel; he already owns a bunch. Ted Cruz could throw down at the Crockett Hotel, billed as only steps from the Alamo. It’s historic, plain and fairly reasonable. He’d be comfortable there, although I could see him bucking at the $24 self-parking fee. We sure would. Jeb Bush doesn’t need a hotel; the Bush dynasty has a lockdown on Kennebunkport. I’m not sure what to do with Ben Carson, Lindsay Graham, Chris Christie and the rest, but the important thing is, if we can guilt all the candidates into booking franchise hotels, it could drive down rental fees for luxury vacation homes. Maybe a few hundred of the rest of us could chip in and rent one. Dibs on the room with the ocean view. After I made a dental appointment last week, the receptionist called back to say we no longer had dental coverage. “Yep, and you don’t have any medical insurance either,” she said. The dentist’s receptionist is a perky sort, so if you’re going to get bad news, she’s a good one to get it from. “No dental or medical, huh?” I asked. I said thanks and that I’d call the husband at work and tell him to come on back to the house as he had been fired three months ago. Why he’d been getting paychecks was beyond me. When I called, he couldn’t talk long because he was busy photographing a spot news story about a gas line break. He suggested I call the insurance company. I suggested he keep his distance from the gas leak, as we didn’t have insurance. I called the insurance company and they confirmed he had been terminated May 31st. The rep then said she couldn’t talk to me without first talking to him. For a brief moment, I wondered how all these people could be wrong. Maybe he had been terminated. Maybe he hadn’t been going to work. Maybe that wasn’t really his credit line I’d been seeing in the paper. Maybe he had another wife and another family somewhere. Maybe I had watched too many Lifetime movies on TV. It took three hours, numerous phone calls, a lot of hair pulling and two emails with a few words in all capital letters, but the situation was resolved. He had not been terminated; someone had read the wrong line on a spreadsheet and set the ball in motion. The fallout from being told you don’t have insurance coverage or a job is nothing compared to the people who are told they don’t have a life. Each month, Social Security mistakenly lists 750 living Americans as dead. That’s 9,000 people a year wrongly identified by the government as deceased. Once you get on the death list, it’s not easy to get off. “Sixty Minutes” recently profiled four people who had wrongly been listed as dead. All of them had been locked out of their bank accounts and assets. One woman had been arrested and taken to jail for suspected identity theft. Several years ago, a man in Utah mistakenly listed as dead visited a Social Security office to protest his “death” in person. The clerks wanted more evidence. The husband and I are thankful that we are once again in good standing with insurance coverage, and that his employer once again has him listed as employed. Oh, and for the record: we are very much alive. We have several neighbors who take a casual approach to lawn maintenance. They are essentially growing native habitats. Word spread about the unofficial wildlife sanctuaries in the neighborhood and rabbits began pouring in from surrounding counties. Small animals have amazingly good communication networks, despite not being adept at Twitter, Facebook or Instagram. Rabbits in particular are extremely social, a statement I base on the rate at which they multiply. They have been multiplying like, well, rabbits. After reconciling ourselves to the fact that we will have no parsley or dill this year, we grew to enjoy their visits. They were adorable. We watched Mopsy, Topsy and Flopsy grow from baby bunnies to toddler bunnies to pre-K bunnies. They were so delightful that their appearances began cutting into my work day. I was continually jumping up from the computer and taking pictures through the window, sneaking out through the back door to creep up for a better angle, chasing them into the side yard and the front yard in pursuit of good shots. Some days I was spending an average of five minutes per hour working and 55 minutes stalking rabbits. Between the husband and me, we have an entire portfolio of rabbit pictures: bunny by the lily of the valley, bunny by the red geraniums, rabbit eyeing a chipmunk, rabbit on hind legs feeding himself and even a picture of the proverbial turtle and the hare. If one momma bunny had 10 baby bunnies every 30 days and there was more than one momma bunny in the wildlife sanctuary, and then the baby bunnies began having bunnies . . .
We now have an assortment of rabbits, representing the entire rabbit lifespan, lining up in chronological order on the patio any given day. There are baby bunnies (adorable! ), pre-adolescent bunnies (prominent front teeth), teenage bunnies (they wear their cottontails low), middle-aged bunnies (widening girth) and mature AARP card-eligible rabbits (you can sneak up very close to them because their hearing is going). The granddaddy of all rabbits is lounging out back today. He looks like he has just returned from Mr. McGregor’s garden. And that he has eaten Mr. McGregor. Possibly even Mrs. McGregor. Our youngest daughter dropped off a suitcase with clothes, jammies and diapers for her one-year-old who will stay with us when her mommy and daddy go to the hospital to deliver their second baby. Along with the suitcase came a favorite blanket, a stuffed animal—and two pages of typed instructions. “She loves cords, outlets, confined corners, climbing on top of things, eating anything she can pick up with her fingers, running and pulling up on things. She’s strong!” That one only had one exclamation mark. Clearly, the baby momma was losing steam. At nine months, who doesn’t? When we visited our son and daughter-in-law after they had their second baby, we saw that our daughter-in-law had four pages of handwritten instructions stuck to the refrigerator for her mother who had come to care for their first. I may have laughed too hard then. Now I am getting my just desserts. My instructions included details on filling the sippy cup with Vitamin D milk and bringing the milk to room temperature. Little does she know the tot drank it cold from our ‘fridge just a week ago. But fine, I’ll bring it to room temperature. There is a list of foods she can have: strawberries, blueberries, pieces of string cheese, bits of bread and peaches. And foods that are off limits: grapes, raw veggies, popcorn, soda and juice. I added bourbon and Chex Mix to her list to see if she catches it later. I read my instructions thoroughly, especially the ones about “Send LOTS of pictures!!!! !” and the one that said, “Please go in after 10-15 min. if she’s crying and try rocking her or holding her upright (like a hug position) to help her fall asleep.” I realized she didn’t write these because she thinks we’re inept. She wrote them because she’s apprehensive. But there’s something else between the lines. She’s fielding a question every mother asks with her second. If you love your first one so very much, where does more love come from for yet another? Oh, sweet Baby Momma, the human heart was made pliable. It was made to bend and stretch and grow with the seasons, like a tree that sprouts a million new buds every spring. You have a deep reservoir of love. It’s bubbling in your heart even now. A mother’s promise: Your babies will be fine and so will you!!!!!!!!! !